I don't know if anyone else viewing this blog watched "Something For The Weekend" on Sunday with Alex Jones from The One Show. She is a beautiful woman and a great presenter on The One Show - but if she has anything sharper in her hand than a plastic spoon, back away! The way she held a knife cutting through pancetta was hilarious. She did say the only thing she could cook was tinned tomatoes on toast, and I'm not sure anyone would even eat that. 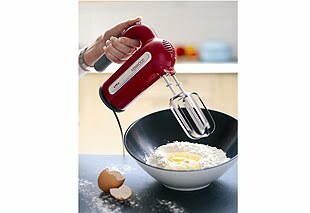 Looks very like this one from Kenwood - the HM791 £44 from Comet, a red iron with grey handle effect! A stylish looking and also robust serious cooking range as you would expect from Kenwood.